Jay Rayner for The Observer visited the nostalgic new pop-up from City worker-turned-restaurateur Richard Humphreys, who dreamed of Gascony, with its restaurants serving duck confit and red wine, and decided to bring his dreams to Liverpool Street. The result is “delightful in a low-key, sweetly romantic way”; the “narrow frame they’ve set for themselves” (of serving just a few duck dishes, plus a vegetarian option which “represents perfectly a Gallic shrug of disdain for non-meat eaters”) works, thanks to the competence of the cooking. Duck confit was “crisp and bronzed and salty and rich”; the duck burger was “pleasingly dense, and constantly on point to leak juices down your chin” and the frites were “exactly as you would wish them to be”. Top Tip: “Le Grand Jeu, for two to share… for £42”. Finish off with the “exceedingly well-made crème brûlée”. 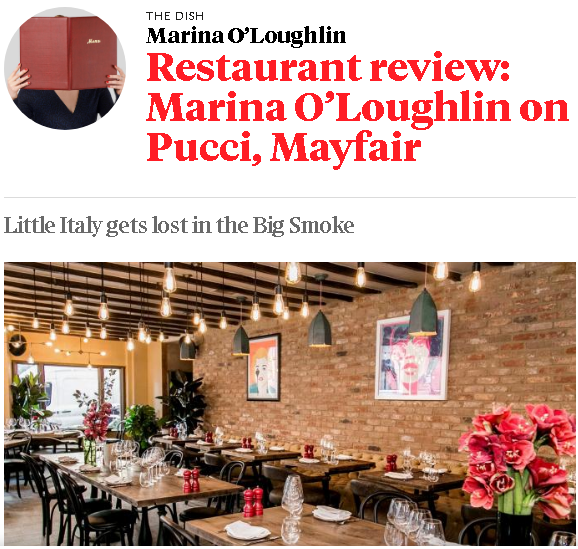 Marina O’Loughlin in The Sunday Times attempted to rekindle the “lost Sixties glamour” that used to be found at Pucci Pizza on the King’s Road, with a visit to its reincarnation (by the owner’s son) in Mayfair. Unfortunately, it both looks and “tastes like the 1980s”; it’s “like the third wave of UK pizzaioli never happened”. There’s an “uneasy mix of retro pizza and new-wave small plates”, and the ‘Made in Chelsea’ clientele and decor are as “bougie, blingy, fake” as the show. 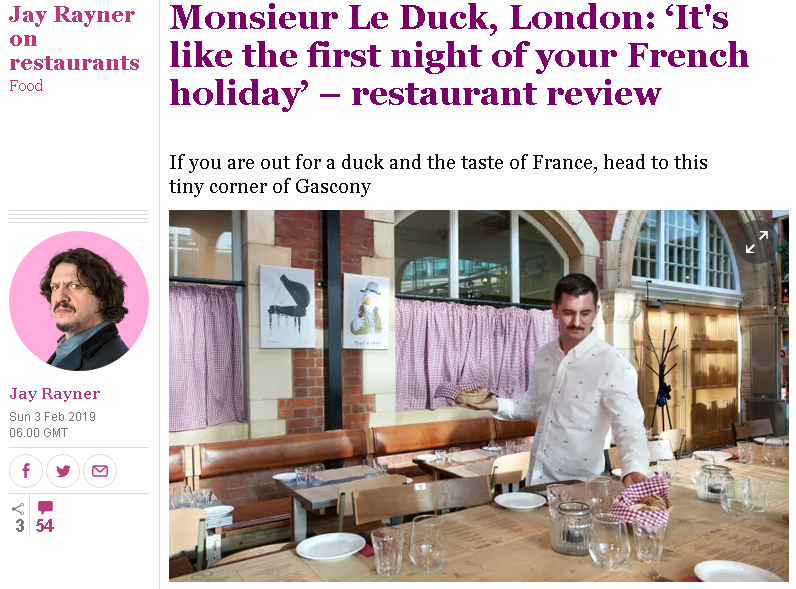 Grace Dent for The Guardian is on a roll – she’s fallen in love with several of her review subjects recently (Brasserie of Light, Levan, The Little Chartroom). And now she’s gone and done it again, with “a beautiful, candlelit… Hackney with a bakery attached” that goes by the bold name of Jolene: it takes a brave person to name their new venture after that definitive heartbreak song by Dolly Parton. 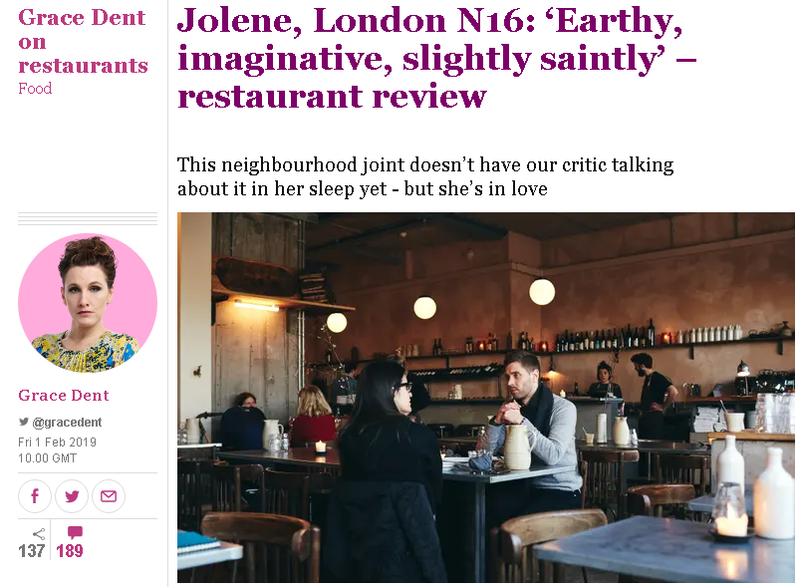 Jolene, from the same stable as Westerns Laundry and Primeur, is a “great date restaurant” with “immaculate” service, lots of space, an “all-natural winelist” and lots of ‘cool London’ touches that Grace enjoys listing in great detail, to make readers outside London “start headbutting a wall”. All of the small plates from the “ever-changing” menu were recalled as “quite wonderful” – all ‘her sort of food’: “earthy, imaginative, slightly saintly, but with a dirty underbelly of oily, salty largesse in each forkful of spelt, cruciferous veg or sustainably harvested, starchy carb”. Fay Maschler for The Evening Standard headed to east London, and the latest incarnation of Bethnal Green’s Town Hall (previously Typing Room and Viajante). Fay’s companion described their meal as “witty and dramatic but nothing over the top or careless or gauche or show-offy, just generous and intelligent”. The carefully-thought-out decor was admired; the ‘short’ tasting menu a “parade of nine dishes” was “a gift to the eye as well as the palate” that finished with “exquisite petits fours including exhilarating pâte de fruits”, and the “fascinating wines are a blessing”. 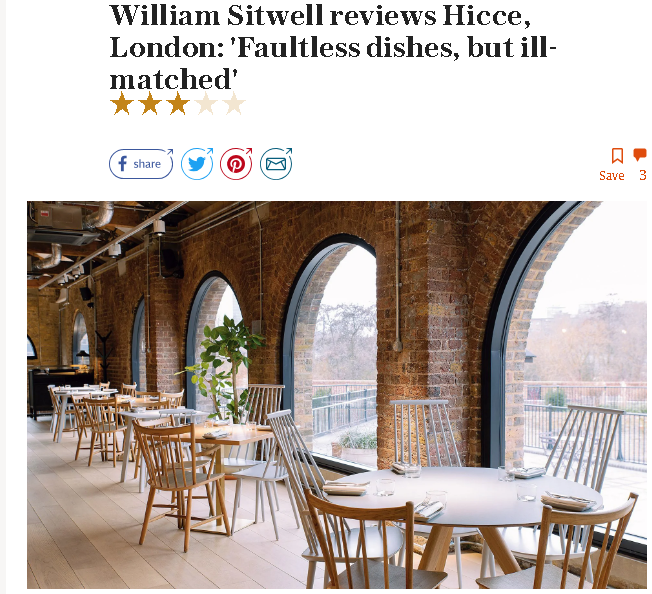 William Sitwell for The Telegraph played catch-up with a review of Hicce, one of the most-reviewed newcomers of 2018; in advance of the visit, he was intrigued and fascinated by the name, location, decor and menu. The reality of the “Norway-meets-Japan-and-comes-back-to-Britain concept” somewhat escaped him, however: “clever juxtapositions of flavours, textures and sauces just aren’t enough unless they’re brought together with a big spoonful of tasty joy.” One dish, of “near-raw cauliflower” brought “zero eating pleasure”. 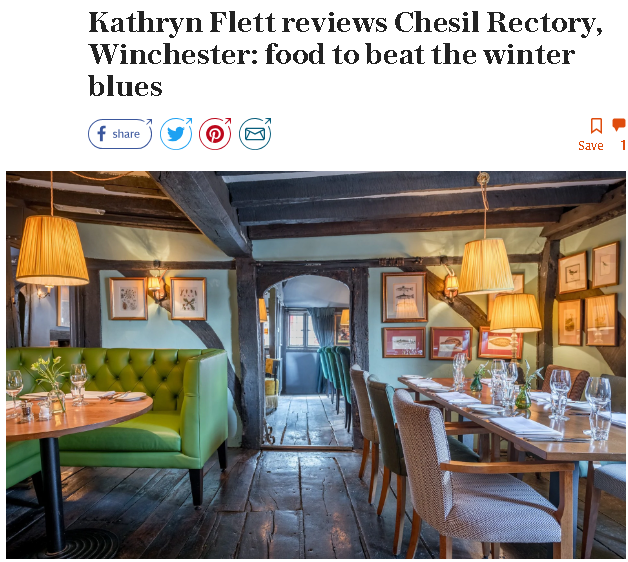 Kathryn Flett for The Telegraph fought off the “winter blues” with a meal at Winchester Chesil Rectory. It’s a “charming space, neaither funky nor entirely trad” on the ground floor of a beamed Tudor building. 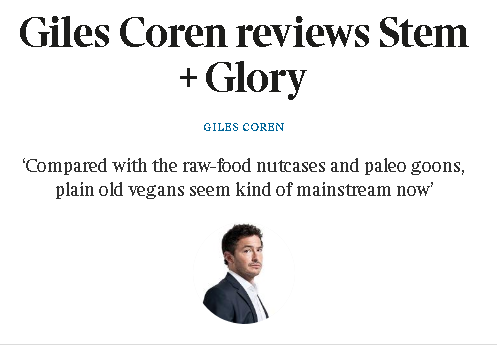 Despite the gloom, Giles was mostly impressed with the fare – edamame beans to start (when he was starving) were “absolutely fantastic”, cauliflower gratin was “good and savoury” and he enjoyed the mango ceviche “as if there were nothing missing at all”. The FT’s Tim Hayward reviewed Red Farm: “it blends half a dozen cultures without transmitting an iota of soul from any of them”. Tom Parker Bowles for The Mail on Sunday stumbled into Essex on the recommendation of a friend, and found a Chigwell institution, Sheesh. it’s a Turkish restaurant, “housed in a rather lovely whitewashed and black-beamed 16th-century inn” and (as you’d rather hope from a Chigwell institution) “doesn’t do discreet”. From the car park (“packed with gleaming Porsches and Range Rovers”) to the black-and-gold decor (table covered in”faux alligator skin, while a large stuffed crocodile hangs from the ceiling”), the whole place is “like the lair of a Great White hunter. Decked out by Lovejoy”. The wine list is “short but sweet”, the service “slick” and the food “magnificent… very serious Turkish food” served from a vast open grill. The eponymous dish is served up “sweet, succulent and sublime”. It’s not cheap, but “you get enough grub to feed an army”. 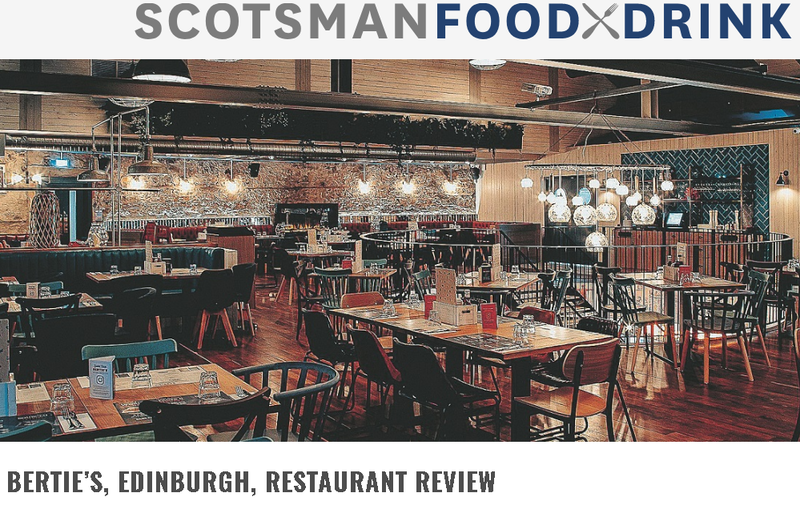 Gaby Soutar for The Scotsman visited the new fish ‘n’ chip restaurant from the Vittoria group: Bertie’s, in St John’s church, has a “heavily branded northern English seaside theme” (complete with saucy photo board), friendly “slightly shonky” service and an “extensive” menu. The main event was a “silky centred slab of crispy battered fish”, accompanied by “a nicely chunky tartare sauce, and Edinburgh-style brown sauce”. Our reviewer gamely opted for the began fish ‘n’ chips, which was “OK, if slightly bland” (and extremely soggy). Brave folk with unclogged arteries might like to try the deep-fried Mars, Bounty, Snickers for pudding; it all makes a nice change from “fancy stuff”. Robin Murray for The Bristol Post mourned the loss of Bedminster veteran Margot May, while welcoming its replacement, set to open in February; .The Nordic Cafe will serve Scandi-inspired cakes, coffee and light lunches. 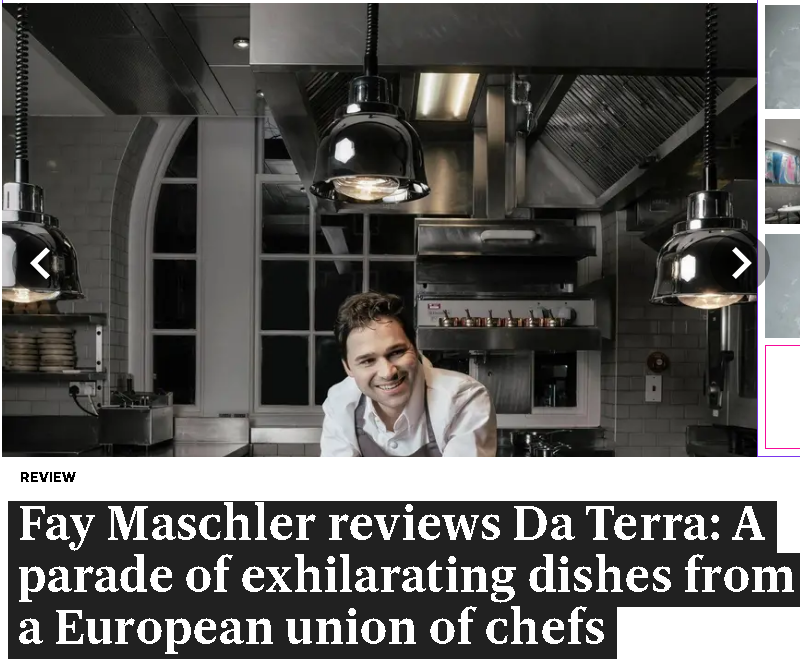 News, Reviews Bertie's, da terra, Fay Maschler, Giles Coren, Grace Dent, Hicce, Jay Rayner, Jolene, kathryn flett, Marina O'Loughlin, Monsieur Le Duck, Pucci Mayfair, Sheesh, The Chesil Rectory, The Evening Standard, The Guardian, The Mail on Sunday, The Nordic Cafe, The Observer, The Scotsman, The Sunday Times, The Telegraph, The Times, Tom Parker Bowles, William Sitwell. permalink.